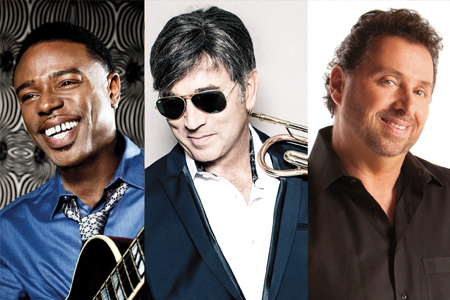 Witness contemporary jazz at its best with three of smooth jazz biggest stars: Rick Braun, Norman Brown, and Richard Elliot. Rick Braun is a chart-topping trumpeter, composer, and producer. Known for his impeccable technical chops, melodic wizardry, and keen compositional prowess, the consummate musician has been thrilling audiences for decades. Braun has made a mark staying true to his own musical voice and eclectic influences that have allowed him to collaborate across genre with some of the biggest names in music including Rod Stewart, Tom Petty, Sade, and REO Speedwagon. Having clenched over 20 number one Smooth Jazz hits, Braun has collaborated with all of the brightest stars in contemporary jazz including Peter White, Dave Koz, and Boney James. GRAMMY Award winner Norman Brown is a multi-talented guitarist, composer, and singer who offers tasty sonic tidbits of classic R&B and contemporary jazz leaving his fans melting into satisfied aural bliss with every succulent, jazz inflected note. He has earned both critical acclaim and record breaking sales, including his song, “Stay With Me” landing at the top of Billboard’s Contemporary Jazz chart and his 2005 compilation, The Very Best Of Norman Brown the best- selling smooth jazz albums of that year. Saxman Richard Elliot was still on the road with Tower of Power when he released his debut album Trolltown in 1986. Embarking upon one of instrumental music’s most dynamic and multifaceted careers, he has scored four number 1 albums and a growing number of number 1 airplay singles. In addition to his participation in all-star tours like Groovin’ For Grover and Jazz Attack, he helped launch another of the genre’s annual franchises, the Guitars & Saxes tours. They come together for one amazing performance that you do not want to miss!